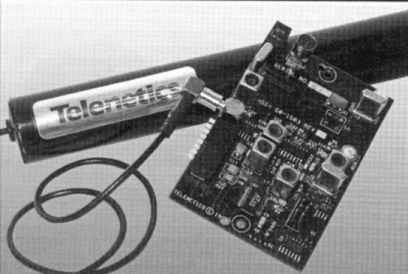 The Telenetics PE2.4RF is a low power, point-to-point radio transceiver module designed for transmitting and receiving data over distances up to 1,000 feet. By operating at low frequency (49MHz) with multi-channel autoscanning, the PE2.4RF provides excellent penetration through buildings, trees and other obstacles, and guarantees highly reliable data transmission. The PE2.4RF module can be integrated into original equipment manufacturers (OEM) products (eg; controllers, RTUs, meters, etc. ), or packaged in the Telenetics "MIU" standalone case for external mounting. In the "MIU" case, the PE2.4RF can be combined with a Telenetics dial-up or leased line modem module to produce an RF modem. The AirWave is a low frequency (unlicensed band), RF transceiver, suitable for transmitting data at 9600bps over short distances. Its high penetration capabilities make the AirWave suitable for point-to point and multipoint applications within campuses, substations and industrial facilities. PE9.6AW is increased to 1 mile. (eg; controllers, RTUs, meters, etc.). to produce a remote RF Modem. Both the PE9.6AW module and the MIU9.6AW standalone unit are supplied with a compact, omni-directional antenna.